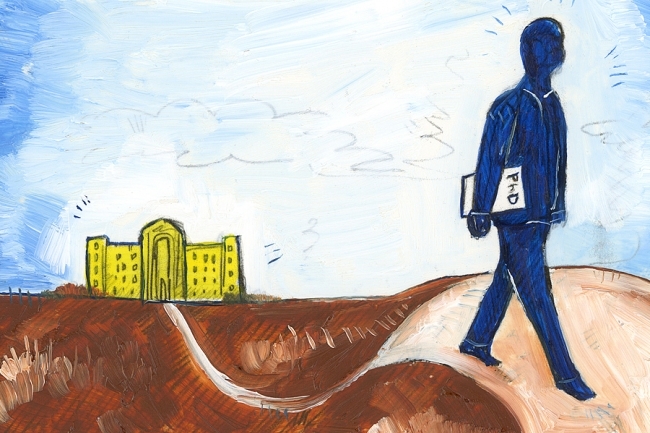 On 8 January 2019, Erin Bartram’s “How PhDs Romanticize the ‘Regular’ Job Market” appeared in the online Chronicle of Higher Education. In the article, Bartram relates a facet of her experience transitioning out of academe, namely the common expectation of those moving into so-called alt-ac and post-ac careers that the job market in the world outside the ivory tower is better than that within it. She argues that the non-academic job market requires the same kind of clear vision academics are expected to have about their own fields and in-industry hiring practices. The article continues by listing factors to consider while engaged in the search for out-of-academe work: reflection’s limitations, prevailing labor competition, mismatches between credentials and requirements, employer uncertainties, and prevailing misunderstandings about academics. Bartram ends on a valedictory note, commenting that the difficulties of the labor market are not reflections on job-applicants’ character, that the success of one makes the success of another easier, and that those of us who have been forced into academic exile or expatriacy are working on a (perhaps romanticized) common cause. Once again, the image is from the piece discussed. This is hardly the first time I’ve written in response to what I’ve read from Bartram, as witness this, this, and this, at least. It seems to be something of a pattern for me to do so, and I have to wonder how it reads, partly to her (if she is aware of being so discussed) and partly to my own readers, who may or may not be tired of seeing me come back to the same ideas time and again. Then again, I’ve read a lot of novels that have had the same plot–and sell millions of copies. I may be forgiven, then, for coming back to a writer whose work I’ve treated before. Of particular note to me are the fourth and fifth of the listed factors for consideration in the article: “Employers are not so sure about your ‘transferable skills'” and “Misperceptions about PhDs persist.” I’ve noted before that my own search for full-time work outside academe took some doing, and that, while I have a solid job with promotion prospects at the moment, I am not so far into it or so far removed from the frantic search that it does not still resonate with me. And that resonance is what makes the two points stand out; they are things I encountered repeatedly as I looked for work, and they came up–and come up–even with the job I currently have. Regarding the former, the idea of transferable skills, I followed the advice I’d been given, both about making arguments in general and in applying for jobs, more specifically. I made the case that the things I had learned to do as I learned to be a scholar would help me to do the things I would need to do in the job. Poring over manuscripts and early editions of texts taught me attention to detail and record-keeping. Writing paper after paper after paper helped me develop a typing speed that is the envy of many a clerical worker. Training in several languages helped me learn better how to communicate with a variety of people. Working through courses and curricula helped me learn how to budget time effectively to address short- and long-term goals, and to do so with minimal oversight and direction. Making that case did not help me much against automated HR systems that regard coursework–and teaching–as things other than the skills required for the job and so discard such resumes as mine out of hand. And it did not much help with employers who felt similarly, or who saw coursework as a pale imitation of experience (which it is, in many ways, though there are things that individual experience teaches only at great pain) and thought that my lack of the latter made me less desirable than others. Even in my current job, there are times when what I have been trained to do that lines up with the stated job description for my present and presumptive positions only does so on paper; my ingrained reaction is the wrong one. Such concerns interact with the latter of Bartram’s points, the idea of misconceptions and misunderstandings. One thing by which I’ve been struck in my time in my present position is the strange regard in which I am held. My coworkers look to me for guidance and insight because I have the credentials that I have, but they are not seldom inclined to disregard what I offer because it proceeds from a place of erudition; I still seem to them to be too pointy-headed for a lot of things I say to work, even when I untangle no few problems that they have. When I interviewed for the job, after having resigned myself to the loss of a long-time dream in terms of the academic job search (I was several years at it before the realization broke upon me), I got the question of why someone with a PhD would want to work the work I work now. And while more than a year at the job has allayed the idea that I am looking in earnest to get back into academe, I am certain it was in force then–and I suspect that it persists to some extent even now. I know that I am fortunate to have found an agency that was desperate enough to take a chance on me–and that is actually a pretty decent job. Sure, it could be better, but no job couldn’t. And I know I am fortunate because I know Bartram has the right of it; employers often look askance at PhDs, both because what academia does is seen as at odds with what the world outside it does and because those who have lived the life of the mind are looked at as longing to return to it. And there is longing for it on my part, to be sure, as I am certain is true for others. But I am equally certain that many of us who are now on the outside, or who are only in the lowest basements of the ivory tower, know well that we will never reach its higher floors and that it boots nothing to bloody our knuckles by knocking yet longer at the doors that lead to them. Those of us who seek outside work and who have it now want nothing more–or less–than to be able to support ourselves in line with what we have long been promised, and in as many words: if we work hard and do the right thing, we’ll have decent lives. The situation persists–and so does the need for your help in addressing it!